Making your experience with Pro Prints Gear a Success! YOU play a major role in the process! Plan ahead and give yourself and us plenty of time. We generally operate on a 2-week turnaround. Production is based on available time in the schedule and can vary. We work very hard to accommodate all customer deadlines. Some specialty items can require as much as 6 weeks to produce. Good communication is crucial for order success! Please make sure you have the name of your sales rep and continue to work with the same individual throughout the process for every order. New customers must pay in advance, and continue to do so unless credit terms are approved. Your order will not go into production until paid in full, so failure to provide payment can delay your order. Quick turnaround of art approval is crucial to meeting your deadline. The need for an art approval should be discussed with your sales rep. Some situations automatically schedule artwork, but repeat orders will not. You also have the option to waive art approvals. Watch for your art approval and check your spam folder if you haven’t seen it. Regardless of when your estimated completion date is, please inform your salesperson if you have an “event date”, or a date by which you need your items. Rush fees will be applied for rush orders 3 days or less. Our ability to fulfill a rush order is determined at the time of the request based on the current production load and product availability. Art approvals are typically not generated for rush orders to aid us in meeting the deadline. Q: How is pricing determined? A: Our pricing is based on a number of factors, specific to the production process the items will undergo. Screen-printed garments are priced by quantity of garments, number of locations of print, and colors per location. Embroidered items are priced by quantity of garments, number of locations, and size of each location. Signs are based on quantity and priced by square foot. Awards are based on quantity and size of engraving. Because Pro Prints Gear produces so many kinds of products, getting a custom quote is the only truly accurate way to price your products. Quantity of items refers only to items with the EXACT SAME design. Each group of items with matching designs will be priced on their own. If you are looking to cut the price of your shirt, you might consider increasing the number of shirts to hit the next price break, cutting down the number of colors or locations, or picking a less expensive garment. Q: How can I get a quote? A: Pricing varies between processes, products, and quantities, so pricing is best done via custom quote. You can stop by our showroom, email us at sales@proprintsgear.com, or give us a call at 1-800-595-0074. A: We don’t have minimum orders, but certain processes do require set-up fees for smaller orders. For example, if you are screen printing, your set-up fees decrease (and will eventually disappear) as your quantity increases. For embroidery and other processes, there are no set up fees (aside from possible digitizing), but pricing will decrease with quantity. Ask your salesperson for more details. A: Pro Prints Gear generally operates on a 2-week turnaround for all orders. Some printing processes or items do take longer than 2 weeks. Please contact a salesperson to get an accurate estimate of the timeline for your order. Please be aware that these timelines are estimated after a complete order has been submitted and paid for in full (if not on billing terms). If you need to receive your job by a certain date, please let us know at the outset. Plan ahead! Q: I need my screen printing order faster than that. Do you have rush options available? A: Rush orders can sometimes be accommodated. If you need your order sooner than two weeks, you’ll need to call the store (1-800-595-0074) to check our availability. If we have the availability, rush fees will apply, and are determined based on the size of order and required turn-around time. We may limit quantities and/or restrict the artwork for these services. Some orders may not be possible to rush. A: Most orders that go through our shop are customer pickup orders. We also offer reasonable rate shipping through UPS Ground, but the customer is responsible for that cost. Q: When do I pay, and what methods of payment do you accept? A: All customers are Pre-Paid, which means that at the time you place your order you must also pay for your order in full. The exception is businesses who have completed our Credit Application and applied for billing terms. Once approved for billing terms, your account will be assigned a credit limit and all invoices must be paid within 30 days of being billed (you are billed the day your order is completed). We accept cash, personal or business checks, and all 4 major credit cards (MasterCard, Visa, Discover, American Express). If you want to call your payment in, we gladly accept credit card numbers over the phone. For pre-pay customers, we will accept a non-refundable deposit for artwork before the order is placed. The art fee is usually either $25 or $50 depending on the project. Once the artwork is approved and the order is placed, the deposit is applied toward the total cost of the order. Q: What is your reorder policy? A: We allow one reorder at your original price if you place it within two weeks of your initial order’s completion. After that time period, or after that one reorder, your price goes back to being based on quantity. Q: Can I make changes to my order once it has been placed? A: You can add product, but check with your salesperson to see if it will affect your timeline. A good rule of thumb is that adding product within a 5 business days of your completion date may delay your order. Art changes can be made up until artwork is approved. Q: Can I bring my own garments in to be printed or embroidered? A: Yes, we can screen print, embroider and heat press on customer-provided garments. Please specify when requesting a quote that you will be bringing in your own items, and sometimes the price varies for this. Q: What if I cancel my order? A: If we have already ordered your garments, you will be responsible for a $25 restocking fee, as we have to pay to return them. Depending on the size of the order, the restocking fee could be larger. Q: What kind of artwork should I send with my order? A: In most cases, vector art is the best to send us. File extensions that support vector art include .ai, .eps, .svg and .pdf. We are able to work with most anything though, even hand-drawn sketches. There may be art fees associated with converting artwork into usable files. If you are sending a photo for reproduction on a banner or sign, the file will need to be high quality. The usability will be assessed by our art dept., and will depend on the size of the final product. Q: Is there always a fee for you to create a design for me? A: The first hour of artwork is free. (Note that some small orders may not be eligible for free art.) Some designs may require more time, and would require an additional art fee of $25-$50. Embroidery, regardless of quantity, requires a digitizing fee for new logos. Digitizing fees are usually $25-$50. Once we have digitized your logo, we won’t ever need to charge that fee again for re-orders. Q: Can I see my design before I place my order? A: If you would like to schedule design work before placing an order and you are a prepay customer, we require a non-refundable deposit for artwork. The art fee is usually either $25 or $50 depending on the project. Once the artwork is approved and the order is placed, the deposit is applied toward the total cost of the order. If you approved credit terms we don’t charge a fee up front, but if you don’t use the artwork for an order you will be charged an art fee ($25-$50) to compensate for our artists’ time. Q: What if I want a mockup before I place my order? Will I still see a proof before you print? A: Once you place your order, we begin working on your artwork. If the design is new, we will send a digital proof, you are able to make any changes you’d like, and we do not print without your full approval. We rarely print one item first as a sample, as our digital proofs are highly accurate. Q: Can you print me a sample shirt? A: Generally, we do not print individual sample shirts. The customer would be responsible for the set-up costs of printing only one shirt. With new artwork, we always send a digital proof, however, which are highly accurate. Q: Can I get the same design printed on different color shirt? A: Yes, as long as your design stays the same color, size and location, there are no additional fees to change the colors of the garments. Q: Can I get the same design in different ink colors on my garments? A: Yes, we can change the ink color(s) of the design as many times as you would like, but there is a $10 ink change fee per screen and each time we change the color. Q: Can I get the same design printed on different kinds of sizes of garments, like hoodies and t-shirts, or Youth and Adult? A: Yes, as long as the setup is the same for us, there is no extra charge for this. Pants and shirts would have different setups, but a Front and Back of a shirt would most likely be the same. Something to keep in mind is that we are only set up to print one size of the artwork, so for Youth and Adult shirts, we would have to print a size of the design that fits on all garments. You can make different sizes of the art for Youth and Adult, but you would be charged $20 per screen for the extra setup. This may also apply to pocket hoodies. Q: What is the maximum print size for screen print? A: The maximum size for art on an adult t-shirt is usually 13″ x 16″. Q: How closely can you match your ink to the color I want? A: We can happily provide you with a color card that shows our standard ink colors. In most cases you will probably find a color that is close to what you have in mind. In the event that our standard colors do not come close enough, we can do a simulation of over 1000 PMS (Pantone Matching System) colors. Custom-mixed Pantone colors are free! Q: What kinds of inks do you use? A: Our standard inks are plastisol, but we also offer silicone, soft, and water-based ink. Q: Can you do 4-color (CMYK) process printing? Q: Can you print a wraparound design? A: Yes, as long as the shirt doesn’t have a side seam and your art fits within our maximum screen size. Larger designs may require several imprint locations. Q: Can I get screen printing and/or embroidery and/or heat press on the same garment? Q: What brands do you offer? A: Visit our products section for several of our vendor websites, or stop in our showroom to look at catalogs with a sales rep. Give us a call if you are looking for something specific, we are here to help! 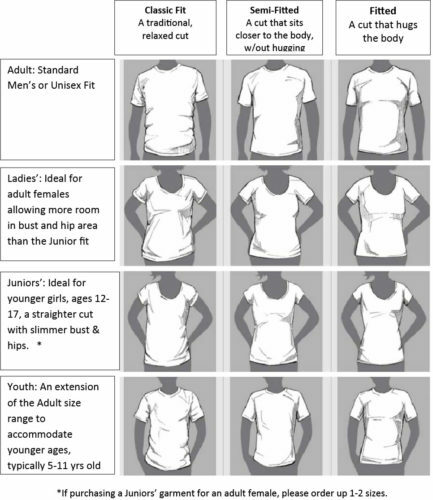 Q: Where can I see a sizing chart for my garment? A: At the bottom of our FAQ menu we have added a general fit guide for reference. For specific items, check the manufacturer’s website, or please ask one of our sales representatives to locate one for you. Q: Do you offer Youth / Infant / Big & Tall sizes? A: Yes! Many products are available in a wide range of sizes, but usually in a more limited color palette for the specialty sizes. If we can’t find something from our usual vendors, we can special order certain products for you. Keep in mind that smaller size shirts may require that your art be reduced to fit. You may also choose to have a Youth-sized and an Adult-sized version of your artwork, but this would incur additional setup fees. Q: Do you have samples of shirts available? A: Yes! We have a wide variety of t-shirts, polo shirts, and sweatshirts in the shop for customers to view. We have also added a new corporate sample section with many pullovers and button-up options to review. Ask about our sample policy if you would like to test garments or sizes. Q: What is the difference between 50/50 and 100% cotton fabrics? A: Generally 50/50 fabrics are lighter in weight. They also tend to wrinkle less and to be somewhat more dye-fast. The polyester is also a stronger yarn and produces a more durable fabric. The 100% cotton fabrics are normally used in the heavier weights and are softer. Both fabrics will undergo some shrinkage when washed, but the 100% cotton will shrink slightly more. Q: How much shrinkage can I expect? A: All of the garments that we use are high quality name brands manufactured to keep shrinkage to a minimum. However, you should plan on some shrinkage during the first few times through the laundry. Typically, garments will shrink approximately 5% across the shoulders and 7% in the length. For a Large or XL garment, this is about 1-1.25 inches in width and 1.5-2 inches in the overall length. Q: How long will the design stay on the shirt? A: The printing will last the useful life of the shirt. What we mean by that is the design will show wear and fading at about the same rate as the garment. Normally this means a life span of several years. A: Please contact us directly for a quote. A: Nope! We will gladly embroider small orders. A: Turnaround time for embroidery is about 2 weeks, especially if your logo is new to us. Q: I need my order faster than that. Do you have rush options available? A: This would have to be determined on a case-by-case basis, but we are generally able to accommodate rush orders. Q: Can I bring my own garments in? A: Yes, we can embroider customer-provided apparel. Q: Will I see a proof before you embroider? A: If it the first time we are embroidering your logo or if the colors have changes and you request a proof, yes. If it is a re-order with no changes to the design, no. Q: Can I get the same design in different thread colors on my garments? A: There is no charge to change thread colors for embroidery. You are also able to embroider on different garments (hats, shirts, jackets, etc.) at no extra charge as long as the design stays the same size. Q: Can I get screen printing and embroidery on the same garment? A: Yes, though the turnaround time would be a bit longer. A: Pricing for vinyl is based on how much of the material we use and how difficult or time-consuming the design is to create and weed. A: No, in fact vinyl is perfect for small, simple orders, as it is much more cost effective. A: Turnaround time for heat press varies, but is about 2 weeks. If you need something sooner, please contact us as we can probably make arrangements. Q: Do you put names and numbers on shirts? A: Yes! We do it all the time! We use a standard font for both so be sure to ask if you want a custom font. Q: Can you put a picture on a shirt? A: Yes, we can! We use a special vinyl formulated for digital printing, similar to the regular heat press material but with a softer, matte finish. It is similar to transfer material, but is more durable and produces crisper results. Q: Will I see a proof before my shirt is made? A: Art Proofs are standard for most designs, but can be waived for time purposes.